Performers include: Ryan Seacrest (host). This live competition is broadcast from a three-story hourglass-shaped structure in the heart of Manhattan. Hosted by Ryan Seacrest, it features contestants testing the limits of their knowledge, nerve, and endurance as they battle each other in intense head-to-head bouts of trivia for several consecutive days and nights. Money is accumulated by contestants sitting in the “Money Chair” and answering trivia questions against a rival. For each second a player remains in the chair, the money meter adds $10 to the total. The longer a contestant stays in the chair, the more money is added until he/she is defeated by a challenger. During the million seconds, the four players who accumulate the largest amounts of money (up to that point in the game) live next to the hourglass in “Winners’ Row” and try to survive there until the million seconds are up. Other contestants displace them if they have longer runs in the money chair. When the countdown clock finally hits zero, only the top four contestants who have made it to the end — plus the final occupier of the money chair — cash in their winnings and battle it out for the grand prize — the largest prize in game show history. Home viewers are able to play along in sync with the game during primetime and get a chance to be chosen live on air as a contestant for the following night’s primetime show. Andrew Kravis defeated Brandon Saunders to win the grand prize of $2,326,346. Kravis’ winnings were increased to $2.6 million, making him the all-time biggest regular-season winner on a single American game show (surpassing Ken Jennings’ 2004 Jeopardy! winnings of $2,522,700). First aired: September 19, 2013. What do you think? 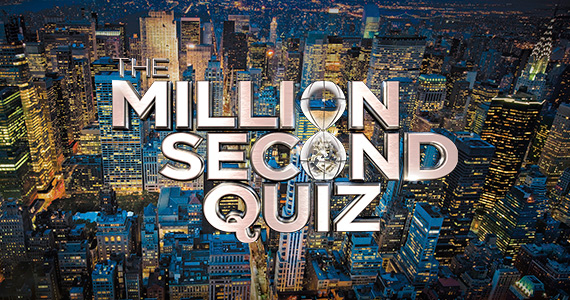 Do you like The Million Second Quiz TV series? Do you think it should have been cancelled or renewed for a second season? Honestly, I really enjoyed it and praying it comes back. The online game was fun to play on my computer since I don’t have a smartphone or tablet. If it comes back, I’ll be playing again and hoping to get on the show. Ryan, bring the show back!!!!!! I agree, it is a crappy show, I say, cancel it. Ryan Seacrest is overrated and overexposed!! a knock-off of “Millionaire”. Millionaire was fun….this one is junk….drop it!! I think ”The Million Second Quiz” is one of the best game shows I have ever watched. I would absolutely renew this show for season 2. I also watch the game show online and I really enjoy playing the game on my app. NBC should definitely bring this show back, I hope this happens really bad.